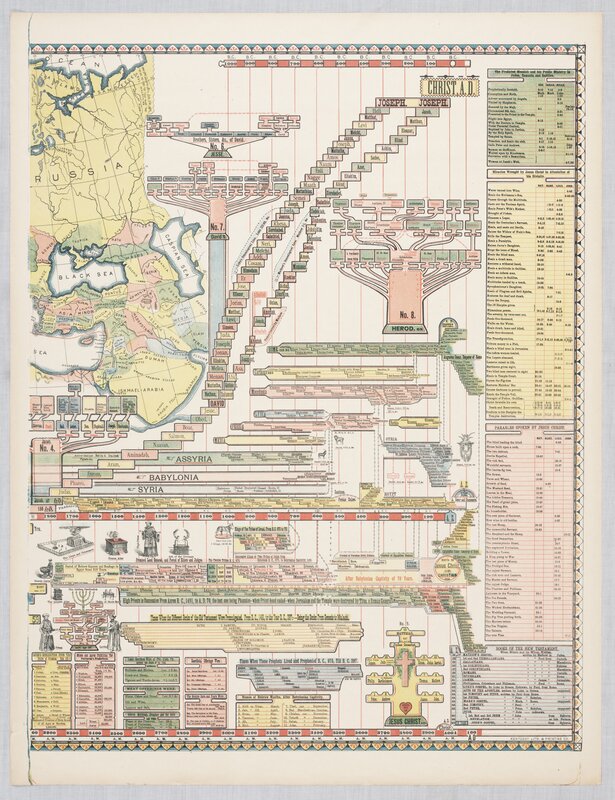 The Jacob Skeen chart (dated 1887; 0.1 cubic feet; 1 item) is a bible chart entitled Genealogical, chronological and geographical chart : embracing biblical and profane history of ancient times from Adam to Christ. The chart, one of 204 printed by the Skeen Chart Co. of Louisville, Kentucky, represents one of the more unusual economic ideas used by the Shakers to support their communities. 2013ms0769: [identification of item], Jacob Skeen chart, 1887, University of Kentucky Special Collections. Brothers Jacob and David Skeen owned The Skeen Chart Co. from around 1886 until 1887. In 1886, they proposed the printing and selling of biblical charts to the Shakers as a means to support their religious communities. The Shakers would underwrite, produce, and distribute lithographic bible charts to be used in the instruction of children. Ultimately the charts were printed commercially in Louisville, Ky. The only Shaker community directly involved in the project was Mount Lebanon in New York, where Shaker sisters backed the charts with cloth. The business shuttered in 1887, after printing only 204 charts. The United Society of Believers in Christ’s Second Appearing (or Shakers) is a religion founded upon the teachings of Ann Lee and an offshoot of English Protestantism originating during the First Great Awakening (1730s and 1740s). Called Shakers due to the rapturous character of their early worship, often speaking in tongues, they believe in celibacy, equality of the sexes, and communalism. They are most well known for their contributions to American culture through their style of craftsmanship and music. After immigrating to New York by 1774, they set up separate communities supported by producing and selling various goods and services, such as their hospitality (tourism), seeds, crops, food stuffs, furniture, baskets, clothing, and printed cards. Currently, Lake Sabbathday, Maine, is the only active and functioning Shaker village in the world. 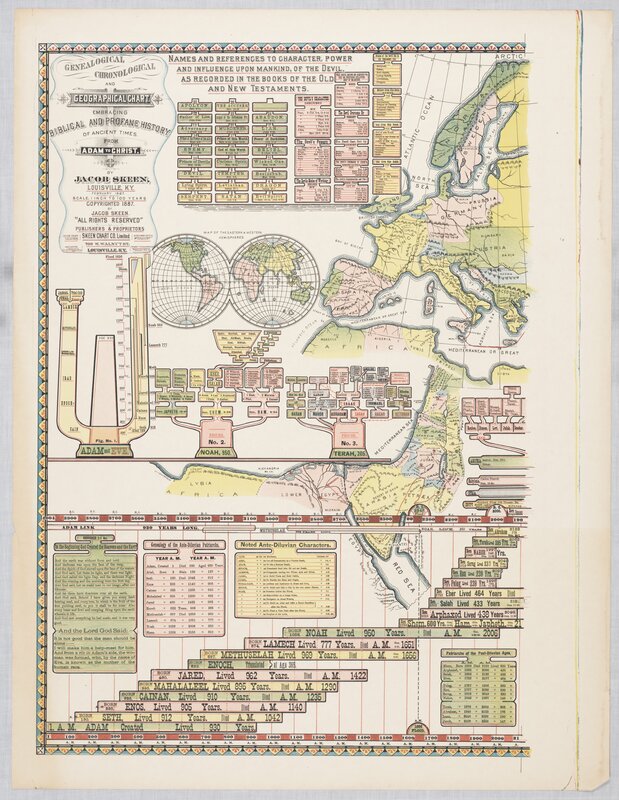 The Jacob Skeen chart (dated 1887; 0.1 cubic feet; 1 item) is a bible chart entitled Genealogical, chronological and geographical chart : embracing biblical and profane history of ancient times from Adam to Christ. The chart, one of 204 printed by the Skeen Chart Co. of Louisville, Kentucky, represents one of the more unusual economic ideas used by the Shakers to support their communities. To be sold as a learning aid for the biblical instruction of children, the chart traces biblical genealogy from Adam to Jesus Christ and contains subcharts listing parables of Jesus and the books of the New Testament. Additionally the charts are inscribed with the names of four major Shaker communities: Mount Lebanon, Union Village, Pleasant Hill, and South Union. However, only Mount Lebanon was directly involved with the project.